Control Of The Going are a band that we've covered since their very earliest days as they've grown from a fledgling band into one of Manchester's most powerful live outfits. We spoke to Liam, Ste and Ash as they put the finishing touches to their debut album, due out later this year, and curate their own stage at this year's Blackthorn Festival following the release of their debut 7" single She / Wildflower earlier in the year. You've been in the studio recently recording your debut album. What can we expect from it? Ste : We’ve got an epic seven and a half minute tune which spans the album. The Message has turned into a monster like you said it would, seven and a half minutes of absolute psychedelic craziness – poetry and stuff – it’s only got about three lines in it. Liam : It’s going to be one of those that never end when we play it live. It’s like the theme of the album, comes in and out. Ste : What we’re planning is that it’s going to be at the end of side one and start the second side. So if you listen to it on Spotify, you’ll get the seven and a half minutes and on the vinyl you’ll have to turn it over. I’m playing the demos in the car on the way to work to get my head around it, it’s about the length of my journey to work. By the time I get to work I’m ready to kill someone. What else is going to be on it? Things we’ve heard or some new songs. Ste : Mostly what you’ve heard. Family’s going to start it. She and Wildflower (from the recent 7” single) isn’t going to be on it, they’re done and dusted. Ste : We’ve got guests on there too. Rob from Hey Bulldog, he plays acoustic guitar on one that he’s half-written as well as a couple of others. He wrote some of the guitar licks and we’ve agreed credits with him. Liam : Wrong Way Records are putting it out. Ste : We signed about six months ago, they've signed a scene really. He came to Manchester and said "you're great, you're great" and signed the bands up. He's got Deja Vega, Freakout Honey and Goa Express. It feels like there's a scene building doesn't there? Ste : Yeah, we've been doing things with them. Helicon he's just signed from Scotland and we've played with Deja Vega a few times. I think they're, other than us obviously, they're the best band around, they blow my head off every time. You've had some pretty notable support recently from the likes of Clint Boon, who played She in South last week, and other figures in the Manchester scene like John Robb. Ste : The power of social media still amazes me and I'm old enough to remember MySpace but Clint's took us under his wing a bit lately playing She and bigging us on Twitter as the up and coming band from Manchester. A mention from him and the interactions and new followers go off the scale. It's the same when John Robb talks about us. People really do follow what the so-called tastemakers like yourself as well tell them and it's great that these people are singling us out. Ste : We've got a guy called Dean Glover who's in TYPES, he plays guitar for them he's a genius. He pretty much manages the studio, Vibe, in Cheetham Hill. It's New Order's old studio, you know where the video for Perfect Kiss was filmed. Liam : We didn't just want someone to record it, we wanted a producer and someone to tell us how to do it and he did. There were occasions when we were playing something and he said "I think you can do this better" or "you've done this before" and eventually it was "give me the guitar and I'll do it in one take." He's like the seventh member of the band for this album. Ste : When we did the lead guitars, we've got loads of pedals and he wired everything in the control room so we had two amps blaring in the live room, he gets everything going and as people are playing he's doing these things with the pedals as we're doing it. That's how the album sounds and it'd be difficult to do it again. Are there any plans for a release date yet? Liam : When it's ready basically. We're looking at December, but we want it to be right, so it'll be ready when it's ready. Liam : The big timing issue will be the pressing, once it's ready it'll take three months to press. But once it's ready, it's going to be called I Love You, But It's Going To Rain. Ste : Which I think is the best title for an album ever. Liam : It's got this impending sense of doom to it, which I didn't get until bad things happened. Liam : When we first had the idea, I thought it was ridiculous and it didn't mean anything. But fast forward a month, you had the Manchester bombings, mine and Ash's Dad dying. The music suits the name, the name suits what's happened. Ash : I don't think it's depressing at all. It has a bit of hope to it. Liam : It's like get prepared and we weren't prepared. It's very Manchester. The artwork is going to be Oldham Street done as a water colour. It's all about planning now, the music's almost done and we have two and a half months to relax, maybe think about new music before the record's ready to go. You're playing Blackthorn Festival this weekend and doing something special? Ste : Last year I played with Fly The Bird and the guy who booked the stage has moved on to the main stage booking the tribute bands and the big acts. He couldn't do anything for us, so they came back and asked if we wanted to do our own stage. So we thought about something along the lines of the Tim Peaks model that we could take to anyone so it's own little thing, it's a Psychedelic Circus, that we can do what we want with, have our own stage, pick the bands so we've gone all out. So we've got us. Black Doldrums are coming up from London, a two-piece we love who make a right racket. 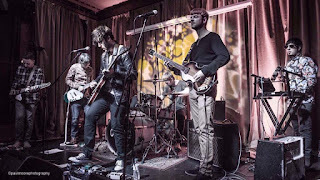 Then we've got The Goa Express from Burnley who are young, a great band we played with in Todmorden and their fans stayed around all night and watched us and Freakout Honey who we know really well. Liam : We're going to deck it out so it looks like a psychedelic circus. Liam : We've got some exciting stuff coming up hopefully with one of the London promoters around a tour for when the album is coming out. We'd like to extend that idea of the psychedelic circus and maybe looking at other areas. Ste : We want to go back to Birmingham too. We got a great reception there, one guy tweeted that we were the most exciting support band he'd seen since he saw Radiohead support Sultans Of Ping in 1992 and at that point, I could have walked away happy, game over. Ash : We're not buying a cannon. Ste : We've also got a really great support slot coming up with Ist Ist at Gorilla in Manchester that we're really excited about. It's a big proper venue, the like of which we haven't played at before and it will be our first Manchester show for about six months. 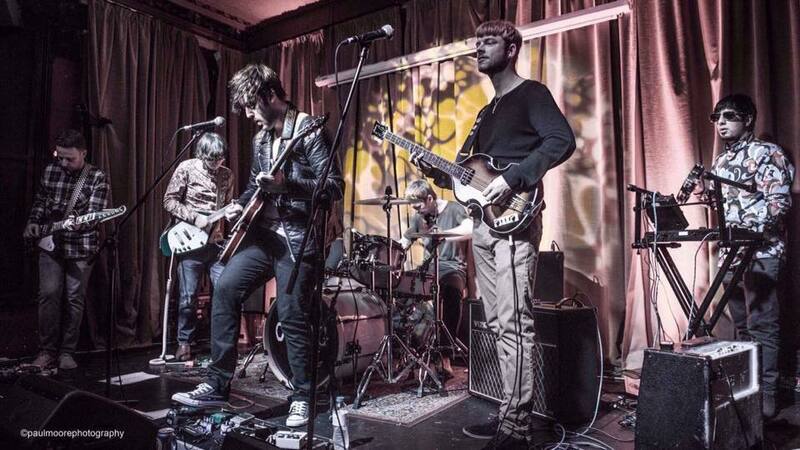 Control Of The Going's Psychedelic Circus takes place at Blackthorn Festival on Friday. Tickets for the festival are available here.